Water safety education at a young age aims to prevent accidental drownings, a leading cause of death for kids between ages 1 and 19, according to the American Academy of Pediatrics. Swimming lessons for children of preschool age and above aid in the prevention of drowning. Additional water safety skills and activities further enhance a preschooler's awareness of proper behaviors in and around the water. Dramatic play activities give preschoolers a chance to practice water safety skills without the danger of real water. One option is to provide life jackets for the kids to wear. Make a pretend boat using a cardboard box or tape on the floor with chairs sitting inside the tape lines. The kids practice putting on their life jackets before entering the boat. Another option is to make a pretend pool or lake on the floor using tape outlines or a blue blanket. Let the kids practice walking when near the water and climbing in carefully to enter the water. Coloring sheets that illustrate water safety skills provide a visual reminder for preschool children. Commercially printed coloring pages available online and through local safety groups are one option. You can also draw your own images to illustrate the specific skills you are teaching the kids. Review the skills represented in the images. Hang the water safety pictures on the walls so the kids see them regularly. Let older preschoolers draw their own water safety pictures and talk about them to aid in understanding the skills. Images of both safe and unsafe water skills help preschoolers decide the proper way to act around water. Print images from the computer, hand draw the pictures or cut water pictures from a magazine to create the activity. 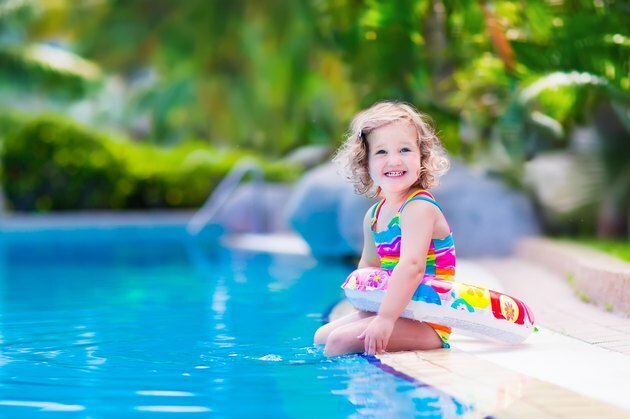 Examples of safe practices include a person wearing a life jacket in a boat, a child walking by the pool instead of running, a young child with a parent in the pool or climbing into the pool using a ladder. Unsafe examples might include a boater without a life jacket, a person diving into shallow water or a person swimming alone. The kids sort the images based on whether they are proper water behaviors or not. Review the safe practices after the sorting is finished. Real-life practice in the water is key to instilling water safety skills in a preschooler. Practice walking in the pool area. Demonstrate how to safely enter the pool before the preschool child practices. Remind the child to stay with an adult in the water. Organized swimming lessons are an ideal setting for practicing water safety skills, but you can also work on them with your child at a public pool or beach. How Many Calories Does Walking in Water Burn?